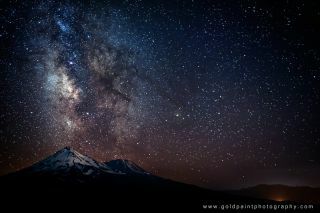 Veteran night sky photographer Brad Goldpaint took this amazing photo of the Milky Way over Mount Shasta, California, during three years of astronomical photo sessions. The image is featured in Goldpaint's night sky observing video "Within Two Worlds." Stars in the far outer reaches of the Milky Way, between 260,000 and 490,000 light-years from the galactic center, are cruising around surprisingly slowly, researchers found. Galactic mass and star velocities are linked, so the results could have big implications. "Because these velocities are so low, the mass of our galaxy may be much lower than we once thought," lead author Alis Deason, of the University of California, Santa Cruz, told reporters Wednesday (Jan. 9) at the 221st meeting of the American Astronomical Socity in Long Beach, Calif.
Deason and her team looked far out into the Milky Way's halo, which extends far beyond the 100,000-light-year-wide disk. They measured the radial velocities of a sample of distant halo stars using two different instruments: the European Southern Observatory's 8.2-meter telescope in Chile and the 4.2-meter William Herschel Observatory in Spain. They found that the dispersion, or spread, of halo-star velocities was about half that seen for stars closer to the galactic center. "This was quite a surprise when we found this," Deason said. Using this information, the team calculated that the total mass of the Milky Way out to such extreme distances may be between 500 billion and 1 trillion times that of our sun — substantially lower than the current leading estimate, Deason said. "The problem is, we are really in unknown territory," Deason said. "We are assuming properties of these stars that are the same in the inner parts of the galaxy. And this is something that really needs to be verified, what we're assuming, in terms of their density profile and also what their orbits are like." Future work along these lines could help astronomers map the distribution of mass throughout the Milky Way, Deason said, potentially shedding light on the mysterious dark matter that is thought to make up more than 80 percent of all matter in the universe. "I think we will be able to use measurements like this to not only say what the total mass is, but also if the dark matter distribution is what we expect," she said. "At the moment, we just don't know."